I know you were brought in late on Tim Burton’s Corpse Bride and from what I gather, weren’t responsible for much of the story, but I’m curious about your thoughts on one particular story element. Is the ending a happy one for Victor? 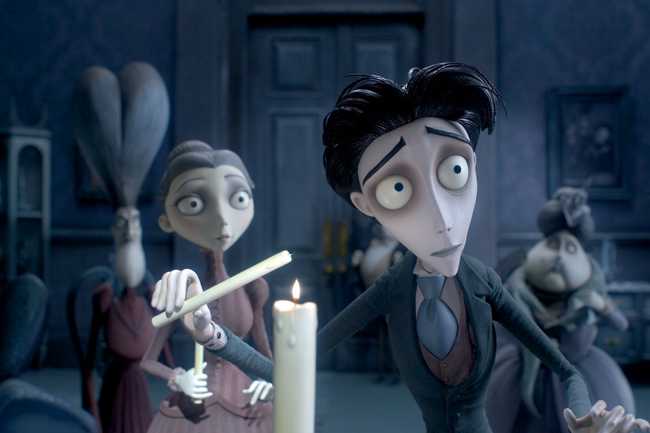 The way it plays, it seems as though it is intended to be a happy ending for him when he winds up with Victoria, but from the audience’s perspective, I’m not sure we see evidence that he would be happier with Victoria than he’d be with the Corpse Bride. The inclusion of the scene where Victor connects with the Corpse Bride while playing piano with her is of course necessary to propagate the plot, but seems to indicate that he’d be just as content living among the dead as he would be with Victoria. You point out one of the real challenges with Corpse Bride. Generally in a fairy tale like this, you’d be really clear about which woman the hero is “supposed to” be married to at the end. At the start of the movie, it seems pretty straightforward: Victor meets Victoria, and both of them are surprised how much they like each other. 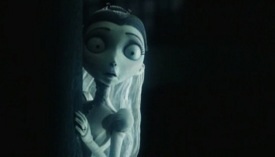 Corpse Bride seems like a monster when she first appears, but is quickly revealed to be funny and sweet. She’s rotting, but not rotten. The solution wasn’t to diminish Corpse Bride, but rather to beef up Victoria. Over the drafts, we made sure to give her more initiative (such as escaping the mansion to plead for the Pastor’s help) and make her situation more dire (the wedding to Barkis was a surprisingly late addition). Through it all, we never wanted to back away from what was unusual about the story: it’s a love triangle in a kid’s film, and you’re sort of rooting for all three characters. Corpse Bride’s decision to stop Victor from drinking the Wine of Ages (added in the last draft) is less about saving his life (after all, death isn’t so bad) and more about seeing herself in Victoria. It goes back to want-versus-need. 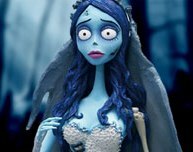 Corpse Bride wants to be married, but what she needs is to free herself from her self-imposed curse. While we’re deliberately unclear about the exact cosmology of the afterlife, the Land of the Dead seems to be a kind of goofy Purgatory. Her transformation at the end would seem to be the next step in the process of life. But is it a little wistful? Yeah. And I wonder if that lack of clearly happy ending limited the upside to the film — which I have to say, performed much better than any movie called “Corpse Bride” could be expected. But I wouldn’t change it. To me, it’s nice to be able to show kids a movie where everything resolves well but not perfectly. I think it’s more honest to show that you can be happy and sad at the same time. Corpse Bride is in theaters starting today — if you live in Los Angeles, New York or Toronto. For the rest of North America, and other parts of the world, you can begin seeing it next week, September 23rd. Last night, I spoke at USC’s 466 class, which screens a different film each week. At the Q & A afterwards, host Leonard Maltin talks with someone involved with the picture, often an alumni. I used to be in the class, so it’s bewildering to realize this was my sixth 466 (after Go, Charlie’s Angels, Charlie’s Angels: Full Throttle, Big Fish, and Charlie and the Chocolate Factory). In many ways, this was the easiest of all the classes I’ve spoken at, because with this film I don’t have as much of that please-please like it I beg you instinct. I feel much less ownership of Corpse Bride than the others. Don’t get me wrong — I’m proud of it — but working in animation is inherently much more collaborative in terms of story. For starters, I was the third writer to work on it, after Caroline Thompson and Pamela Pettler. Then there’s a whole department called “Story,” whose job it is to figure out how to convert the screenplay into storyboards, and along the way, a lot gets changed and rearranged. Altogether, it’s much less “my” movie than the others. Often, I’d get storyboards from London for scenes that were about to shoot, and would have a day or less to tweak the dialogue before an actor would record the needed lines. Whenever I visited the stages outside London, most of my time was spent watching the scenes already shot, and discussing with the rest of the team how to handle this moment or that. At absolutely no point could I get precious about things needing to stick closer to how they were written. I was there to help, so I helped where I could. I felt like a craftsman rather than artist, and that’s fine. Reviews so far have been really good, so here’s hoping it gets a good reception. A lot of people ask me, “Isn’t it too scary for kids?” Not really. If your kids like Halloween, they’ll be fine. It’s never gory, and the Land of the Dead stuff is pretty light and breezy. Script magazine has a long-ish article about Corpse Bride, interviewing both Pamela Pettler and yours truly about the story and process. Pamela, Caroline Thompson and I share writing credit on the movie, but I was never really clear who wrote what and when. From the article, it appears that Caroline wrote a detailed outline, while Pamela wrote the first real script. I was the in-production guy, who did tweaks and fixes, smoothing out rough spots and writing lyrics for a few new songs. Since it wasn’t a WGA-covered movie — animation often isn’t, much to the WGA’s chagrin — there wasn’t a normal arbitration process to figure out who got what writing credit for the movie. Fortunately, the final credits as determined by the studio seem right to me. Again, since it’s not WGA, none of us will get residuals. Which blows. But we knew that going in. The movie, incidentally, is great. One of the cool/weird things about working on an animated movie (this is my second, after Titan A.E. ), is that you get to see the entire movie a lot while it’s in production. Every couple of weeks, I’d get a new tape via FedEx from London, showing the newly animated scenes and the pencil storyboards for what was about to shoot, with a mixture of real and temp voices for all the characters. In all, I’ve probably seen the entire film 20 times in various incarnations. About a month ago, I finally got to see the finished product at a test screening in the Valley. The movie is flat-out gorgeous on the big screen, with the stop-motion animation having a realer-than-real quality. It’s so sharp that it looks 3D. But what really surprised me is that all the story tweaking we did along the way feels so seamless. You wouldn’t know that characters got added and dropped along the way, or that significant points of backstory were still in discussion midway through shooting. Or that it wasn’t always so musical. All films, including live-action, go through major changes during editing, but with this kind of animation, there really is no distinction between production and post-production. Once you shoot a frame, it’s finished, forever. So it’s heartening to see that the nail-biting decisions paid off. It feels like it was shot from a locked, finished script. It wasn’t. The other great lesson you learn from writing animation is surrendering your monopolistic control over every little word, the cinematic “Not Invented Here” syndrome. Moving from the page to the (miniature) soundstage means going through the storyboard artists, who often find new ways of playing a beat that you never considered. During production, a lot of my job was tweaking dialogue to match new bits of business that the artists had invented. While actors in a live-action movie will improvise, that kind of multiple-voices collaboration doesn’t happen as often. In the case of Corpse Bride, it really helped. There’s a new trailer up for Corpse Bride, which tells a lot more of the story than the teaser trailer did. I have mixed feelings about the new trailer. Visually, it all looks great. This one shows a lot more of what makes the animation so distinctive. For instance, pay attention to Corpse Bride’s veil, how it flutters and flows. Then remember that this was all shot one frame at a time. Creating the illusion of continuous movement was incredibly difficult, and they did it incredibly well. I’m not crazy about the voice-over. The rhyming doesn’t really work for me, and the announcer is the same guy who does all the stuff for the WB Network (“Tonight, on an all-new Gilmore Girls, Rory blah blah blah”). It feels too much like a featurette for my taste. I would have suggested stopping at the shorter, funnier teaser. But that’s just me.